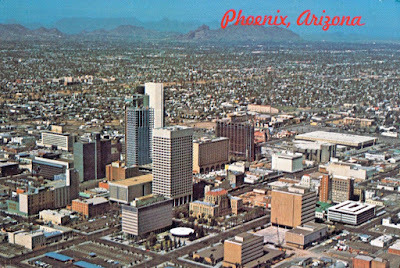 The two most common misconceptions about the Phoenix, Arizona area are 1) it never rains there (it's a desert, after all! ), and 2) the valley is completely flat. But people who know Real Estate know that these things are not true, and it has driven the value of land in the Phoenix, Arizona area for over 100 years. The Salt River valley tilts gently from northeast to southwest. If you just imagine it as a gigantic pool table, the water runs towards the Salt River (south) and towards Tres Rios (west). Yes, it's a very slight tilt, and it wouldn't matter much if the valley didn't get the type of torrential rains it gets every summer, and if the snow didn't melt in the area just northeast of it, which is one of the largest watersheds on planet earth. And that means that Phoenix has been struggling with severe flooding since it began, in 1870. There has been an enormous amount of flood control engineered in the valley, including the gigantic dam on the Salt River, built in 1911, called Roosevelt Dam. And there are a lot more dams, but, if you've lived in a valley for a while, or have studied its history, you know that it never seems to be enough to hold back the flood waters. Historically, the worst flooding in the Phoenix area has been near the Salt River, and on the west side. My neighborhood, in Glendale, has been protected for the past twenty years by the largest flood detention area in the Salt River Valley, which gathers up the water that flows from the north and diverts it to the Agua Fria River. If you're curious about it, go walk along the Arizona Canal. By the time you get just north of where I am, it's so gigantic that it doesn't even look like a diversion channel anymore, it just looks like Thunderbird Paseo Park. Home construction in Phoenix began moving north by northeast beginning in the 1890s. Old ads advertised that these areas were "high and dry". Unless your house was built next to a wash, you were OK. But for people who were assured that it never rained in Phoenix, or that the washes didn't flood going downhill, they were in trouble.